Piracetam is the original Nootropic or Smart drug designed to improve memory, enhance your brain functions and stimulate the central nervous system. Originally developed in the 1960’s, Piracetam has been is use primarily in Europe ever since and is known for its non-toxic and non-addictive properties. What Will Piracetam Do For Me? Piracetam is an effective cognitive enhancer that has been used successfully to treat a wide range of conditions and been shown to increase a person’s attention levels and improve memory and intelligence. Piracetam also helps to slow down ‘senile involution’, dementia and Alzheimer’s disease. In tests and trials, Piracetam showed significant improvement in memory consolidation and recall in elderly out-patients suffering from ‘age-associated memory impairment’. Piracetam has also been used to improve patient’s recovery from strokes particularly improving post stroke speech impairment (aphasia). Another use has been in cases of acute and chronic cerebral ischaemia, which is decreased blood flow to the brain. Taking Piracetam restored speech and the use of limbs in these patients, it also increased neuronal activity in the brain when measured with Electroencephalography (EEG). Piracetam works on the Corpus Callosum, the region of the brain that links the two hemispheres. It is this action which most experts believe is the key that gives Piracetam users the ability to channel greater brain potential by connecting the logical side of the brain with the creative side more effectively. What Dosage of Piracetam Should I Take? A common dose is three Nootropil 800mg tablets twice a day, then lowering to one or two Nootropil 800 tablets twice a day after the first month. Please note the effect of Piracetam can be increased if taken with DMAE, Centrophenoxine, Choline or Hydergine. When Choline and Piracetam are taken together there is a synergistic effect that causes a greater improvement in memory than when taken alone. Side effects are minimal and seldom experienced. Piracetam is a trusted and versatile smart drug and stimulates a key part of the brain, to give you a safe, non-toxic, non-addictive mental boost. Piracetam was one of the first products antiaging systems stocked and it remains one of the most popular over twenty years later! Antiaging-systems.com can now offer a new version of Piracetam, called Pira Pro. In the larger pack size of 100 x 800mg tablets, and priced at just $17.99 it shows remarkable value for money. Nootropics may increase learning and memory in healthy individuals through a distinctive power to promote what has been termed hemispheric-super-connection. S.J. Dimond et al , "Effects of nootropics" Psycopharmacol. 64, 1979 341-348. "My doctor recommended IAS & their products when he prescribed me Piracetam. The packaging for the Piracetam tablets is fabulous & the tablets are really easy to remove. I have been ordering for many years & have been very pleased with the products & their services." Each tablet contains: Main ingredient: Piracetam (I.N.N) 800 mg. Excipients: Polyethylene glycol 6000, colloidal silica, magnesium stearate, hypromellose (E464), orange yellow, S (E 110), titanium dioxide (E 171), Polyethylene glycol 400, talc. Piracetam acts on the central nervous system by means of different mechanisms. It modulates cerebral neurotransmission, is a neuronal protector improving metabolic conditions at the cell level and, although not a vasodilator, improves microcirculation on account of its haemorrheological properties. Degenerative vascular cerebral pathology related to age. 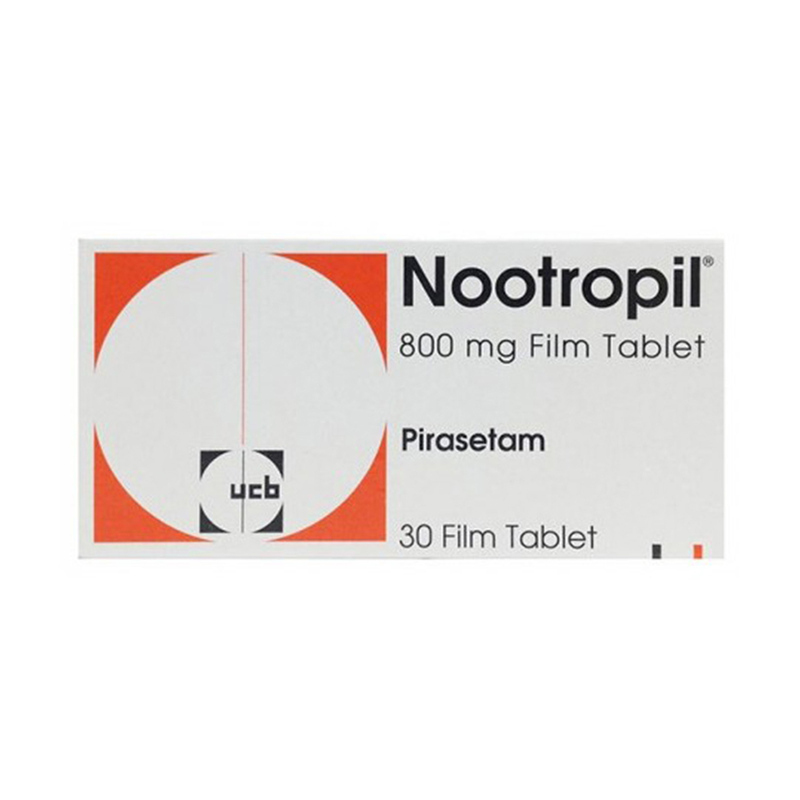 Nootropil should not be taken by patients with serious renal insufficiency (creatinine clearance lower than 20 ml/min). Since Piracetam is eliminated in urine, patients with renal insufficiency should take this drug with caution. Abrupt suspension of treatment should be avoided, since this can cause a myoclonic or general crisis in certain myoclonic patients. A single case has been reported in which the concomitant use of Piracetam and thyroid hormone extracts (T3 + T4) has produced confusion, irritability and sleeping disorders. Its interaction with other drugs has not been described. The safety of using this product during pregnancy has not been sufficiently established. Although studies in animals have not shown teratogenic effects or effects on fertility, using this drug during pregnancy is not recommended except under a doctor’s strict supervision and only when the benefits justify possible risks. Likewise, breast-feeding is not recommended. This pharmaceutical product contains Orange Yellow S as an excipient. This may cause allergic reactions, including asthma, especially in patients allergic to acetylsalicylic acid. The daily dosage (to be broken down into 2 or 3 doses) and length of treatment are to be established by the doctor, depending on the state and clinical evolution of the patient. Administer a daily dosage of 4.8 g of Piracetam (6 tablets per day) for the first few weeks. Then lower the daily dosage to 2.4 g (3 tablets per day). Because the therapeutic response is quite variable, the dosage should be adjusted to the patient’s own needs. A recommended protocol would be to begin treatment with 7.2 g of Piracetam daily, increasing this dosage by 4.8 g per day, every 3 or 4 four days until obtaining a satisfactory response or a maximum dose of 24 g daily. Subsequently and depending on the results obtained, the dosage of other anti-myoclonic treatments should be reduced if possible. When adjusting the posology, follow your doctor’s instructions. Once treatment with Piracetam has begun, it should be continued for as long as the cerebral pathology persists. Nonetheless, every 6 months an effort should be made to reduce or stop treatment. To prevent the sudden reappearance of the disorder, withdrawal should be carried out by reducing the dosage by ½ g every 2 days. Piracetam is non-toxic even in high doses. Massive accidental overdose can be treated either orally or intravenously with forced diuresis or dialysis in the case of renal insufficiency. In the event of overdose or accidental swallowing, consult a doctor. Cases have been reported of nervousness, irritability, insomnia, anxiety, trembling and agitation and, in certain patients, fatigue and drowsiness. Occasional dryness of the mouth, increased libido, weight gain and hypersensitive skin reactions. These side effects are generally shown in elderly patients. In the majority of cases, such symptoms subside with a reduced dosage. If any other adverse reaction not described in this leaflet should occur, consult your doctor or chemist. This drug should not be used once the expiry date shown on the box has elapsed. KEEP ALL PHARMACEUTICAL PRODUCTS OUT OF THE REACH OF CHILDREN.